The members of the Australian Homeopathic Association in Tasmania proudly hosted the 9th Australian Homeopathic Medicine Conference. 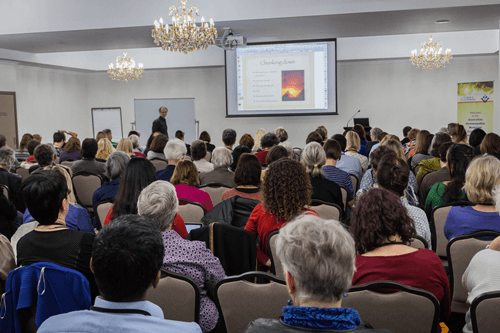 It’s hard to believe that the small homeopathic community of Hobart put together such a professional and enjoyable conference as we have just experienced over the weekend of 24 – 26th October 2014. But they rolled their sleeves up and gave us the best ever conference held to date. The theme of ‘Grass Roots Homeopathy – Back to Basics’ was to encourage a look at parts of our trade further than Classical Homeopathy, going back to our basic tools as Homeopaths. It was about remembering the important skills that we may have forgotten along the way, and honouring both the mistakes and triumphs that we and others have had that have caused us to learn and grow as practitioners, and as a profession. No small ask but so many of the speakers achieved the goal. For a start Dr Joe Kellerstein said he had made it a ‘mission’ to re-introduce homeopaths to the principles and practice of original Hahnemannian medicine. In a post-grad program he devised, he encompasses the same methods that created the astounding cures detailed in thousands of pages of journal articles over two centuries that homeopaths are rightly proud of. His mission for the Hobart conference was to take us back to these basics. He gave a lively talk about a questioning style which he calls Four Quad Questions. It never seems to go astray to be reminded of strategies to help our patients open up. Apparently Dr Joe Kellerstein has been working on developing this style of questioning for a good while. He graduated as a Chiropractor in 1981, a Naturopathic Doctor in 1984 and completed his Fellowship in Homeopathy with the Canadian Academy of Homeopathy in 1989. As well as a busy practice, over 80% of which is devoted to Homeopathy, he has lectured at the Canadian College of Homeopathic Medicine since 1997. Someone whose life is dedicated to teaching and healing. There was a great display at the homeopathic conference put together by Chrissie Materia. She used the research done by Barbara Armstrong (our very own Australian homeopathic historian) to make such an interesting corner of photos and memorabilia. I didn’t know that homeopathy had been around so long down in Hobart. Apparently the first time homeopathy was mentioned in Tasmanian newspapers was way back in 1830, reprinted from an article which had appeared in the Edinburgh Review about this ‘new system of cure’. We will never know the name of the first person to bring homeopathy to Hobart. It may have been any one of the many thousands of men and women who emigrated from ‘the old country’. In preparation for life in a pioneering country, where there would be little if any access to qualified medical practitioners, some of them would have brought with them their homeopathic medicine chests and instructions for their use in emergency situations. By 1848, homeopathy was sufficiently well-known and used in the Hobart Town community that Mr Frederick Atkinson believed that he could succeed with a pharmacy specifically aimed at supporters and users of homeopathic treatment. 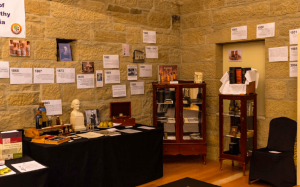 He opened The Homeopathic Establishment in Macquarie Street, which, according to research to-date, was Australia’s first specialist homeopathic pharmacy as advertised in newspapers of the time. Mr Atkinson also advertised that he provided consultations in Hobart; therefore it would appear that he was Tasmania’s first known lay homeopath. However, the pharmacy was only advertised for about 6 months, and Mr. Atkinson disappeared from Tasmania’s public records. However, the practise and use of homeopathy in Tasmania did not die, and continues to this day. Local AHA members have represented the voice of homeopathy on TV programmes, in market places, in newspapers, on the Internet, through participation in the annual World Homeopathy Awareness Week, and by doing an amazing job hosting the Homeopathic Conference we have just been to. Gerry Dendrinos has been in practice as a homeopath and herbalist for the past 14 years in Canberra, ACT. In addition to his homeopathic training, Gerry trained as a traditional herbalist under Kim Dudley, Dorothy Hall and the American herbalist/homoeopath Matthew Wood. Gerry’s talk was full of snippets of information useful in day-today practice. But of course this was just one of all the carefully thought out presentations at the homeopathic conference of which there were too many to include in this small review. Our Aurum Project presentation at the homeopathy conference this year took the form of a melting pot. We had two melting pots, 0ne about digestive disorders which ended up focusing on the management of sugar/ food cravings and obesity and the other was about depression. This was followed by a smaller session on the hot topic of Ebola Virus.